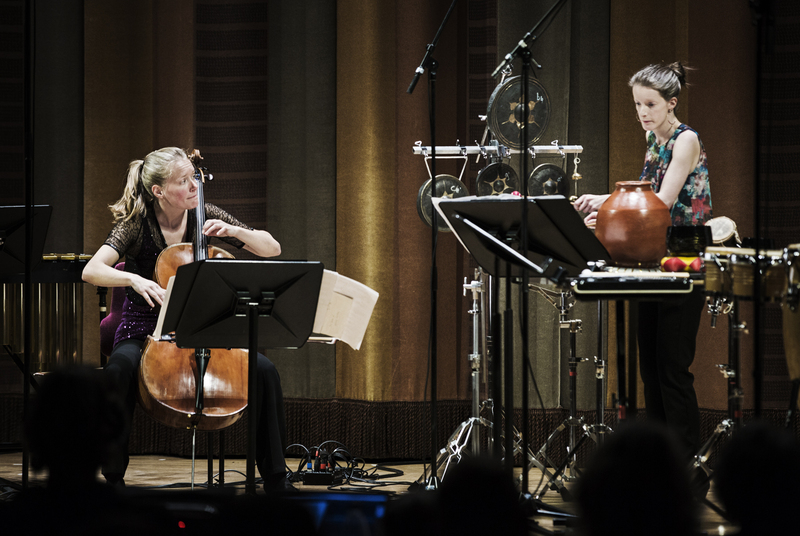 UmeDuo performing Bells and Tides at Svensk Musikvår 2018. Photo: Hampus Andersson. Bells and Tides (2016) is a piece for cello and percussion. It was commissioned by Swedish sisters Karolina and Erika Öhman (UmeDuo) and the Swedish Arts Council. The commission was to write a piece freely inspired by music from another culture. I choose Carnatic music of southern India, with the most concrete inspiration source being the characteristic percussion instrument Ghatam. Percussion instrumentation: 3 singing bowls, temple blocks, ghatam, dholak, frame drum, pitch-bend gong, 4 Thai gongs. In 2017 the piece was performed at Satellite Salon, Cedar City, Utah by Ashley Walters and Lynn Vartan. UmeDuo, St Petersburg International New Music Festival, reMusik, 2016. Video by reMusik. When UmeDuo commissioned Bells and Tides they asked for a piece freely inspired by music from another culture. I choose Carnatic music of southern India, with the most concrete inspiration source being the characteristic percussion instrument Ghatam. The pitch of the Ghatam used by UmeDuo, a quarter tone low F, became the fundament of the piece. Around the sound of the Ghatam I wanted to build an undulating, inharmonic sound world, expanding and contracting – Tides. In the cello; glissandi, natural harmonics and prepared strings creating gong-like sounds, in percussion; Japanese singing bowls, gongs and saucer bells. The second part focuses on hands and fingers on the Indian hand drum Dholak, frame drum and Ghatam and quiet percussive sounds on the cello. När UmeDuo beställde Bells and Tides önskade de ett verk fritt inspirerat av musik från en annan kultur än vår västerländska. Jag valde karnatisk musik från södra Indien, där den mest konkreta inspirationskällan blev det karaktäristiska slagverksinstrumentet ghatam. Tonhöjden på den ghatam Erika använder, ett kvarttonssänkt F, blev utgångspunkten för styckets musikaliska material. Runt instrumentet ville jag bygga en inharmonisk, svävande ljudvärld, som utvidgas och kontraheras likt tidvattnets skiftningar – Tides. På cellon används glissandon, naturflageoletter och strängar som preparerats och i pizzicato får en gongliknande klang. I slagverksstämman kompletteras ghatam av dobaĉi, gongar och saucer bells. I sats II utforskas slagtekniker med händer och fingrar på den indiska handtrumman dholak, frame drum och ghatam tillsammans med svaga, perkussiva ljud på cellon.